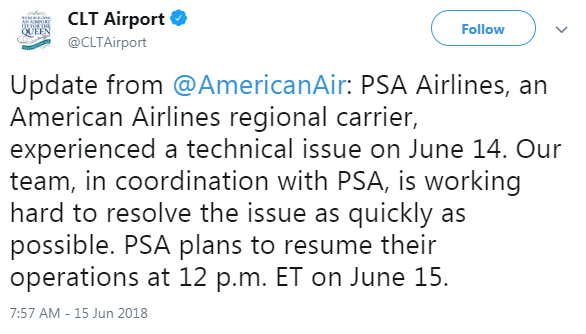 It’s still not clear when American Airlines regional carrier, PSA Airlines, will resume normal flight schedules at Charlotte Douglas International Airport, an American Airlines spokeswoman said Monday afternoon. A few hundred flights originating in Charlotte have been cancelled since Thursday. Katie Cody, a spokeswoman for American Airlines said Monday they’re working hard to fix what they call a computer hardware problem. It involves the system the airline uses to schedule flight crews. "We have sent teams from our headquarters in Dallas-Fort Worth to PSA headquarters in Dayton, Ohio to help them resolve this issue as quickly as possible," Cody said. American says it cancelled at least another 70 PSA flights Monday and has bought more than 800 hotel rooms for some without a flight. Charlotte Douglas Airport says it has extended concession and checkpoint hours to accommodate stranded PSA customers. It’s also providing emergency supplies like diapers and blankets. American Airlines expects its regional carrier PSA Airlines will resume normal flight schedules around noon today. Hundreds of people have been stranded at Charlotte Douglas International Airport after the airlines cancelled 600 flights throughout its system last night and this morning – about half of them originating in Charlotte.